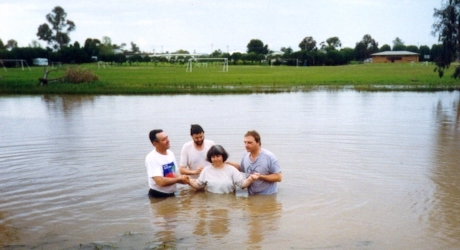 At New Life, we believe that baptism is an important step of faith for all believers. We recognise too that this is an issue which christians have very divergent views about. This page describes our views and practices, which are, we believe, in line with the Scriptures and the ancient traditions of the church. In describing what we do, we are not denigrating what other christians do in good faith... we are just stating what we do. Water baptism is a command of Jesus (Matthew 28). It is a symbol of cleansing, of death and resurrection, of deciding to follow Jesus. 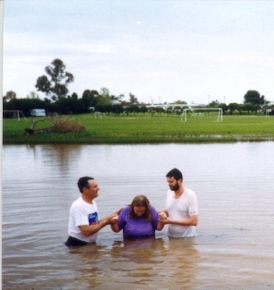 We immerse people because the word "baptise" actually means to plunge something into a liquid. Baptism is meant to represent the fact that in Jesus we die to our old life of sin and then rise up to a new life in Christ. We do not believe in baptising infants, as some churches do. We believe that baptism comes AFTER we receive Jesus and not before. Our testimony is that God does something powerful in water baptism. 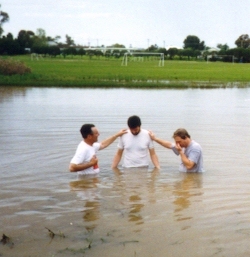 Even long-standing christians discover that God meets them in a new way in water baptism. God starts to deal with the sins and habits that may have been entrenched in our lives for many years. Because of the spiritual power that converges at baptism, we believe that people need to search their hearts very carefully before taking this step. It is not to be taken lightly, for a joke, or just because that's what other people do. Our practice is to baptise people three times... in the name ofthe Father, the Son and the Holy Spirit. We want people to know that God is Three-In-One, that it's not just any god, but the God of the Scriptures. Back to "What We Believe"